Summer is the perfect time for a juice detox. Fresh fruit and vegetable juicing is the perfect way to cool down as well as nourish your body and enhance detox. These days with so many preservatives and processed foods being eaten people really don’t realize how much their body is missing out on the vital nutrients it needs. Many of the minerals, vitamins and antioxidants your body needs for optimum health have been removed or destroyed by the processing. One of the best and quickest ways to replenish these nutrients and get rid of toxins that undermone your health is through a juice detox. You will feel great because your body will totally thank you for giving it these much needed things. Your energy will go up, your health will improve and it will even boost your immune system so your body will be ready to fight off just about anything from the common cold to the flu. When doctors, like Endocrinologist, David Heber, say that juice cleanses are total BS they have forgotten or not even seen the work of Dr Paavo Airola and Dr Max Gerson. Airola showed that juicing and juice fasting was superior to water fasting practiced by the early naturopaths and was one of the most efficient ways of correcting disease. Dr Gerson developed a juicing and special food regime that became know as the Gerson Therapy which cured people of all sorts of degenerative diseases including cancer. The skeptics say that we all have a liver and kidneys that detox us all the time and need no help but if that is the case why do we all now harbor all sorts of toxic chemicals in our tissues? According to Airola the detox capacity of the liver, kidneys, lungs and skin is greatly increased during juicing and and metaboic wastes and toxin are quickly expelled. Then we have people like Jay Kordich aka The Juice Daddy, Angela Stokes Monarch. and Joe Cross who all had amazing health changes from juicing. When he was 25, Jay was diagnosed with a serious illness and was told he may not have long to live. He began juicing large amounts of raw carrot and apple juice. It wasn’t long before he recovered and the direction of his life was changed forever. In 2005, at the age of 82, Jay and his wife Linda co-wrote his latest book Live Foods, Live Bodies! and they continue to inspire hundreds of thousands of people around the world. Angela Stokes Monarch lost 160 pounds in just two years with juicing and a raw food diet. She completed a 92-Day Juice Feast in Feb 2007 and since then has been helping thousands of people around the world improve their health and well-being through juices and a raw food diet. Angela is the author of A Juice Feaster’s Handbook, which has helped thousands on their juice detox journeys. Joe Cross, whose documentary Fat, Sick And Nearly Dead, tells the story of how he lost almost 100 pounds and healed his autoimmune disease by following a 60-day juice fast. Joe says ” I believe that juicing is a great way to supercharge your body with the incredible nutrients found in whole plant foods – and the volume you’re able to take in when juicing is far more than you would be able to eat. So it’s a great way to move that dial, and as that happens, your body starts to return to its natural healthy state”. Fresh fruit and vegetable juices hardly need any digestion and are absorbed easily into the body. Your cells are supplied with greatly needed nutrients so they can function efficiently. When it comes to juicing for health there are 5 key recipes that will serve as a foundation to to get you started. When you are still in the learning stages of juicing you want to start with simple, quick and easy recipes. If you go with recipes with too many steps or hard to find ingredients you will get off track as soon as you are missing ingredients or you are having a busy day. All of the above ingredients will serve as a foundation for more sophisticated recipes but they will help you get started. When you go to the grocery store to shop for your produce you will not need a list. Just remember your ABC’s. Apples, Beets, Carrots, Celery, Cucumber. All of the above ingredients have a pretty decent shelf life. You will need fewer trips to the grocery store and will have the ingredients there when you are ready. When possible go with organic especially for carrots. A large amount of the nutrients lie right under the vegetable skin. By choosing organic you will only have to wash your carrots before juicing. Conventional produce runs the risk of a pesticide covered surface that should really be peeled before juicing, causing you to miss out on the full benefits. The 5 must have juices are either 2 ingredient or 3 ingredient recipes. This will teach you the flavors of the different vegetables and how they mix together, allowing you to eventually experiment on your own. Carrots are a great base for your juice recipes. They provide a lot of liquid volume when juiced and are slightly sweet. 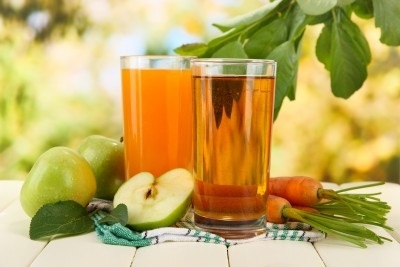 When you find yourself in the mood for more of a sweet juice go with carrots, or apples, or both! Carrots also provide an excellent source of nutrition. An eight ounce glass of carrot juice has more than 10 times the recommended daily allowance of pro vitamin A as well as the equivalent vitamin C of a couple of bananas. Strong in beta-carotenes, some researchers suggest that carotenes provide anti-cancer properties. Of course you can start with just juicing a couple of carrots just to get the taste. This juice is perfect for afternoon “pick me up” when you might normally reach for that candy bar or other sweet treat. It will serve as a healthy substitute. You have heard about the old expression that “ an apple a day keeps the doctor away” well the next recipe “Doctor’s Orders” combines apples with two other key ingredients. Apples contain phlorizin, a flavonoid, that is thought to target the liver and help stimulate bile, a vehicle the liver uses to detox toxins. Caution: Avoid purchasing apples that have been waxed. The wax can trap pesticides on the surface of the skin of the fruit making it very difficult to remove harmful substances. Again… organic is better if your budget allows. Beets (beetroots) have been used in traditonal forms of medicine to cleanse the system and there is growing evidence that there is a scientific reason for this. The deep red vegetables are rich in a natural chemical called betalains that can help the liver eliminate toxins. They are also rich in Vitamin C, important for the detoxification sytem. Beet greens contain many important minerals and can be juiced as well. Try juicing both with and without the greens to see which taste you prefer. It is important to get the proportions correct. 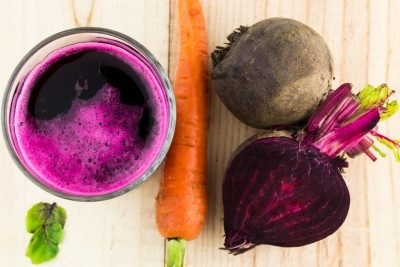 Most juicing experts recommend keeping a 1:4 ratio of beets to other vegetables. For example 1 beet for every 4 carrots or ¼ beet for every carrot. The following recipe keeps this proportion. It also contains cucumber which is very cooling and refreshing when juiced solo or in combination with other vegetables. Long used as a treatment for eyes in solid form the juice is said to be very good for your skin. Low in calories, but high in sodium, celery is a great way to add more of a savory taste to your juices.It contains the plant compound luteolin whch is thought to reduce inflammation and by inhibiting the release of inflammatory molecules. It can reduce inflammation in the brain which contributes to dementia and memory problems. The following two recipes use celery to balance out the sweetness of the other ingredients.This recipe is a great one when you are pressed for time. Quickly and easily jump start your summer juice detox with these 5 easy and tasty juice recipes. Some great ideas and recipes, thanks for sharing. Have never tried a juice detox before. Looks like a healthy way for an overall body cleanse. I make juice drinks for myself all the time… I was given a blender as a house warming gift from my mom and almost wore it out. Until I read your great post I never thought of making juices that would cleanse too. I will be killing 2 birds with one stone from now on, drinking healthy, natural juice drinks and detoxing at the same time. What a wonderful gift to give someone and to receive. Good to hear you are making good use of it. So many people stick them away in a cupboard and forget about them. It’s good sometimes to make smoothies as well as or instead of juices especially green ones. Although I started off doing a lot juicing when I had chronic fatigue which played a big part in my recovery I have gone over to Green Smoothies these days. They tend to be more sustaining. Sandy, thanks for responding. A nice, and totally unexpected surprise. I will give Green Smoothies a try. Thanks! My grandmother used to put an apple in my lunch every day so I had it at school and we always had apples somewhere within easy reach at home. She would say, “An apple a day keeps the Doctor away.” Now I learned reading your blog post that apples contain phlorizin. I guess she was right. Yes, our grandmothers usually were right. She also said that you should eat your greens and we all know that greens have been proven to be vital for good health. How did it come to be that the minerals, vitamins and antioxidants we need to gain from what we eat was the very thing food processors removed to be able to mass produce what they market? With the minerals, vitamins and antioxidants gone, would it not be more correct to call what they produce “filler”? After all, the word “food” suggests something of nutritional value. I don’t think that food manufacturers set out to remove vitamins and minerals from the food. It’s a side effect of refining food. For some reason someone thought that “white” products looked more attractive than “brown” products and it was also a way of increasing shelf life. Unfortunately the refining process stripped off many vitamins and minerals some of which were added back to flour and cereals. Vitamins are also added to food, usually in tiny amounts, to make consumers think they are better than they really are. I think yu have hit the nail on the head when you say it should be called filler! This was and enlightening read. I knew celery was low in calories, and if what I have read is true you actually burn more calories digesting celery than it contains. However, I did not know celery is high in sodium. I eat celery sticks as a snack, to curb hunger, rather than something that will add calories, so I eat a lot of it since I am dieting. I don’t want to be consuming a lot of sodium though. I guess it’s back to the carrot sticks, which I’m not so crazy about. Hi Jessy, Celery contains natural sodium which is not the same as salt that most people buy in the supermarket to use in cooking and to put on their food. The sodium in vegetables is balanced with potassium so is not a problem. Carry on eating it as a snack.